In Now What? 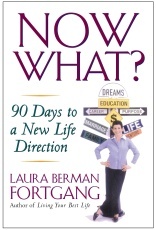 pioneering life coach Laura Berman Fortgang shares the process that she has used so successfully with hundreds of clients to help them make major changes in their lives. Whether it's moving on from a dead-end job, discovering an entirely new creative outlet, or answering the age-old question "What am I meant to do with my life?" this book provides a clear and infinitely practical ninety-day program to discover a new direction for your life. A woman who left her unfulfilling job to discover the rewards of doing motivational work with professional athletes. A high-fashion shoe executive who found more gratifying work helping adoption agencies around the world place children in permanent homes. A highly paid corporate consultant who became a minister. Full of inspiring and empowering exercises and tools, Now What? guides readers -- day by day and step by step -- through a process that will lead to true life satisfaction and fulfillment.